The MGs of Baltimore, Ltd. Car club was established in 1977. The club represents over 150 members in the Metro Baltimore area. As the name implies, the club centers its activities around the preservation and enjoyment of the cars that bear the classic MG marque. The club is affiliated with the following national organizations: The North American MGA Register, The North American MGB Register, and The American MGB association. 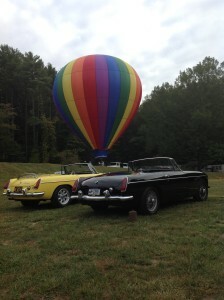 Internationally, the club is affiliated with the MG Car Club and The MG Owners Club. The clubs activities include sponsorship of the nationally known “MGs on the Rocks” car show, a series of challenging (and FUN) historic car rallies, as well as numerous fun gatherings all through the year. The club membership meets at 7:30 PM the first Tuesday of every month at Johnny Dee’s Lounge. Johnny Dee’s is located at 1705 Amuskai Rd; Baltimore, Md, just off of Loch Raven Blvd at Joan Ave. From I-695 Take the Loch Raven Blvd. Exit south. Go about 1 mile, turn left onto Joan Ave. Park in the upper lot. For more info go to their website at www.JohnnyDeesLounge.com Come early and have diner. We start arriving between 5:30 and 6:00 p.m. The meetings are about sharing experiences, taking care of club business and normally include a monthly tech session provided by our MG “technical guru” Randy Kegg. Many members of MGOB are owners of the other classic British marques and all are welcomed to join the club. The Octogram, the club’s newsletter is published monthly by the MG’s of Baltimore Car Club.